Preheat oven to 300ᵒF/149ᵒC. Line one cookie sheet with baking paper and set aside. In a bowl, combine cornstarch and sugar. Mix well then set aside. Using a stand mixer on high speed with whisk attachment, beat the egg whites, cream of tartar, salt and vanilla extract until soft peaks form. Reduce speed to low and gradually add the cornstarch and sugar mixture. Return to high speed and beat until stiff peaks form. Fold in the cocoa powder. Transfer mixture to a piping bag with a star tip. Pipe meringue kisses on the cookie sheet and bake for 40 minutes. Turn the oven off and leave the tray inside the oven for one hour. Let the meringue kisses cool at room temperature for at least 10 minutes. Once cooled, dip half in melted chocolate. 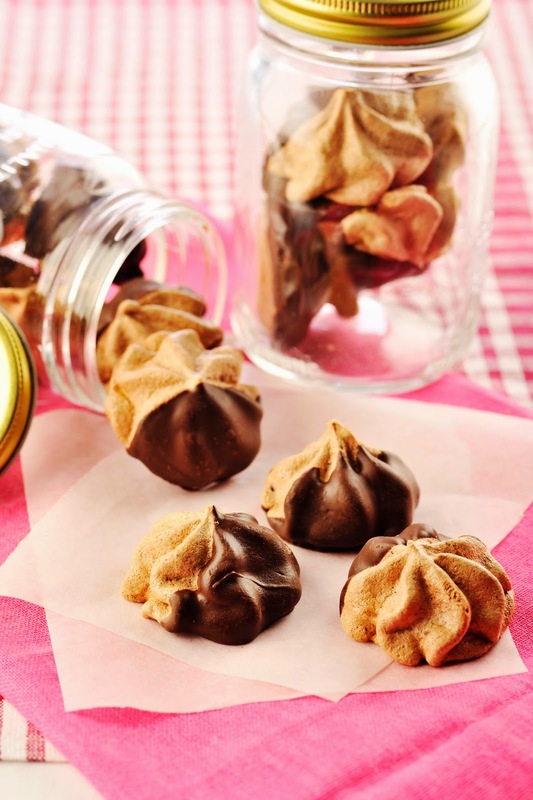 Let the chocolate-dipped meringue kisses set on a lined cookie sheet and transfer to an airtight container.